In New Jersey, drivers who are charged with driving while intoxicated (DWI) might not realize the long-term ramifications and costs of a conviction. DWI in New Jersey is not a criminal charge, but a traffic violation. That doesn’t make it any less of an inconvenience and an expensive one at that. There are many extra charges and practical costs that drivers who are convicted of DWI will have to deal with. These vary based on the amount of alcohol found to be in the driver’s system at the time of the arrest and the number of times they have been arrested for DWI. 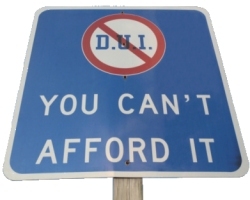 Even a first offense DWI can be extremely costly. When law enforcement stops a vehicle on suspicion of DWI in New Jersey, they must have a viable reason for doing so. This could be swerving on the road or some other dangerous action. Once the stop is made, the officer will investigate for DWI by examining the driver to see if there are any signs such as bloodshot eyes and slurred speech. Then there will be field sobriety tests such as the walk-and-turn and the horizontal gaze nystagmus test. Finally, the driver will be asked to take a breath test to determine the blood alcohol content (BAC). There are different percentages of BAC that can lead to an arrest and the higher the BAC, the worse the punishments are. A driver who is over age 21 and registers 0.08% or above on the breathalyzer will be arrested for DWI. Drivers under age 21 who register 0.01% and commercial drivers who register 0.04% will also be arrested. Penalties for a first offense DWI with a BAC of 0.08% to below 0.10% will be the following: a driver’s license suspension of three months; fines between $250 and $400; $100 to the drunk driving fund; $100 to the Alcohol Education and Rehabilitation Fund (AERF); $230 to the Intoxicated Driver Resource Center (IDRC); $1,000 annual surcharges for three years; $75 to the Neighborhood Services Fund; and up to 30 days in jail. These penalties are worse if the driver registers 0.10% to 0.15% BAC with the possibility of seven months to one year of a suspended driver’s license, heftier fines and the possibility of an ignition interlock device being placed on the driver’s vehicle. A DWI conviction can also increase the damages from personal lawsuit if you injured someone. Drivers who are charged with DWI a second time within ten years of the first time will have harsher penalties thrust upon them. The driver’s license is lost for two years. The fine rises to between $500 and $1,000. The IDRC is up to $280 while the other expenses stay the same. Jail time can be from between two days to three months. Community service is possible along with the ignition interlock device. A third offense DWI will cost the driver his or her license for ten years. The jail sentence can be for as long as six months. The fine will be for $1,000 and the annual surcharge will be for $1,500 per year for three years. There will also be community service and the ignition interlock device. Drivers will also have to pay higher insurance premiums after being convicted of DWI. Drivers who think they’ll simply pay their fines and be done with it often don’t realize how much of a problem a DWI conviction can be. If there is jail time, they might not be able to keep their job. If they need their vehicle or driver’s license to work, to go back and forth to school or to help a family member, this will no longer be a possibility due to the driver’s license suspension. Insurance in New Jersey is expensive as it is and with a DWI conviction on the record, this cost is made even more onerous. It’s not a simple matter of getting caught, paying the debt to society and it’s over. This is something that can follow you around for an extended period of your life and cause a great inconvenience. Drivers who are confronted with these issues need to understand the facts surrounding a DWI arrest. The law enforcement officer has to follow rules just like drivers do. For example, as stated before, if a traffic stop is made without reason the charges might be invalidated. If the officer gives the field sobriety tests on uneven, rocky ground, there is a chance that this could be deemed unfair. When a breath test is given, the breathalyzer machine must be properly calibrated and the officer certified to administer the test. The officer is also legally required to observe the driver for 20 uninterrupted minutes prior to giving the test. Any of these factors could lead to the charges being dismissed. A cost that is generally not hidden is that which is paid to an attorney. While drivers might think they are better off just pleading guilty, they would be well-advised to rethink that strategy. If there is a chance that the charges could be dropped for any reason, an attorney will be well worth the cost of his or her services to avoid the other hidden costs of a DWI that could cause major problems down the proverbial road.